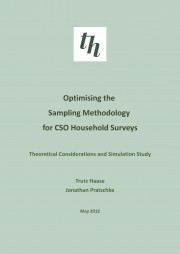 This report assesses alternative sampling designs for CSO household surveys, such as the Quarterly National Household Survey (QNHS), the annual Survey on Income and Living Conditions (SILC) and Household Budget Survey (HBS), as well as considering the design of a potential future General Household Survey. The sampling designs currently used by the CSO were inspired by a report written by Prof. David Steel (1997), whilst the report Variance Estimation for Complex Surveys (2003) assesses the precision of estimates from two of these surveys, the QNHS and HBS. The development and refinement of Small Areas (SA) – the new census geography – has already led to change in these designs, whilst the publication of Small Area Population Statistics (SAPS) from the 2011 Census of Population is likely to reinforce this trend in coming months. SAs are of a similar size to the blocks that have been used as Primary Sampling Units for CSO surveys for many years, with the advantage that a full range of aggregate-level indicators will be available for these units. The 2011 SA definitions incorporate further improvements when compared to the 2006 boundaries, yielding a more uniform population distribution. This opens up a range of new possibilities for designing and managing household surveys in Ireland. The report is divided into two parts, the first of which discusses various aspects of sampling design for household surveys. Whilst discussing each issue individually, the study highlights the ways in which these are interlinked, including the need to develop a comprehensive strategy that optimises simultaneously across various factors. Part Two builds on this discussion, presenting the results of a simulation study of alternative sampling designs using individual-level data from the 2006 Census of Population. In total, 27 different sampling designs are compared, spanning small (5,200-6,000 households), medium-sized (20,000-26,000 households) and large (38,600 households) surveys. Three different measures of precision are used to compare these designs and their strengths and weaknesses are discussed in detail. The report provides detailed recommendations in relation to appropriate sampling designs, including considerations in relation to sample size, the degree of clustering, stratification and selection procedures for areas and households.